The Concert Band was created in 2014 as a third wind band for the instrumental music program at Oak Mountain High School. Consisting of 60 members in grades 9-12, the ensemble performs popular high school literature from the wind band repertoire. Participation in this ensemble is open to any student at Oak Mountain High School, and the group often contains several first year players. Private instruction is strongly encouraged, and students in this class frequently receive individualized or small group instruction during the school day. 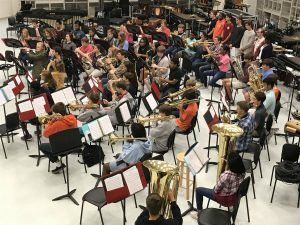 The Oak Mountain Concert Band performs five times each school year – the fall concert, the Christmas concert, a Pre-MPA concert, at the Alabama Music Performance Assessment, and a spring concert.